English Language Publications for FREE! Whilst you are visiting any town or village throughout the Axarquía region, a selection of English language newspapers and magazines is available for you to collect, free of charge. 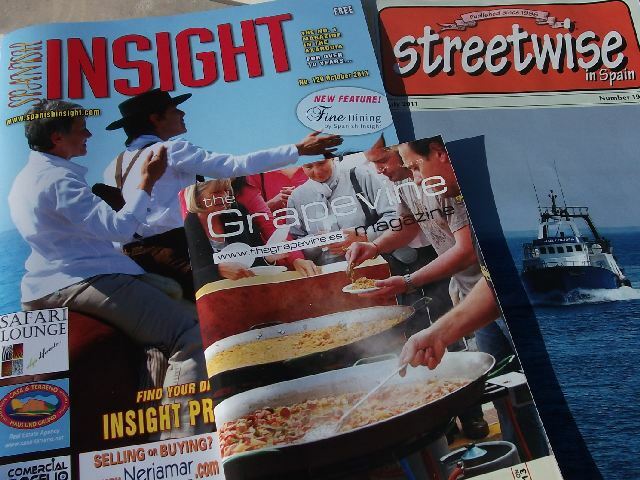 These publications, including Spanish Insight, SolTalk, Streetwise, Marketplace, Grapevine, Sentinella and Euro Weekly are useful for both tourists and residents alike. Each contains information about ‘what’s on’ in the local area as well as some well-written articles on a wide range of topics, recipes and items for sale – including properties. (You can CLICK on the links to be taken to the online versions of the publications). Sadly, in order to make-ends-meet with their budgets, these magazines contain more advertisements and fewer articles as time goes by, but I guess that happens round the world. You will find these free magazines in many estate agents, bars, cafes and other such popular places. How do you like to discover what’s happening in your local area? This entry was tagged Andalucía, Cómpeta, culture, East of Malaga, Europe, life, lifestyle, Malaga, Nerja, Spain, travel. Bookmark the permalink. Free is good and yes, publishers sadly need to have this advertisements to survive. Thanks for sharing. Soltalk seems to have much more editorial and less advertising than the others though, it is my favourite! There is no chance of finding an English magazine in Italy, Sometimes the Italian ones will have a page that they have translated using a blind half wit of a man. Really? You surprised me there. Surely there are lots of British expats living locally? I think the Expats live in Florence, Milan and Rome, all 20 of them. In the past 5 years I have met 4 British Expats, who live in Monferrato. Perhaps all the Expats are sat in their back gardens getting drunk on the local wine. There is a website called http://britishexpats.com/forum/ It is quiet funny at times. People join and then write, I am a 19 year old hairdresser, I want to live in Italy but I don’t speak Italian. Does anyone know of an English Hairdresser shop where I might find work? So no I am the only mad Englishman in these parts. Love the idea of free English publications. When I come across such a publication here I treasure it, since I had to travel to the city to get any English publications. In our versions, I’ve found that for once the ads are a benefit, telling me about new businesses or products that might be helpful or interesting – that ‘xyz’ for instance is importing flyscreen, or that a new Australian/Canadian trained dentist has returned to the island and opened a practiace. Often the ads are more interesting than the articles themselves!